Las Vegas Review-Journal mystery: Who bought the paper for $140 million? Who just bought Nevada's biggest newspaper? And why? The questions are mounting -- and some of the newspaper's own reporters are revolting -- in the wake of a mysterious sale announcement on Thursday. The new owners of the Las Vegas Review-Journal are "refusing to reveal themselves," Jon Ralston, the esteemed Nevada political reporter, told me on CNN's "Reliable Sources." Ralston said the unusual situation leaves readers unable to determine "what kinds of conflicts of interest might exist." Other media experts said they could not recall a similar circumstance involving a major paper in recent decades. Review-Journal reporter Sean Whaley tweeted on Saturday, "I am just going to say it. I am personally offended & embarrassed that whoever bought the RJ does not have the guts to say so." He added the hashtag "what the hell." Another reporter, Eric Hartley, linked to a Huffington Post story about how the newspaper's initial story about the sale was later edited to remove quotes about the strange arrangement. "This is simply wrong," Hartley tweeted. 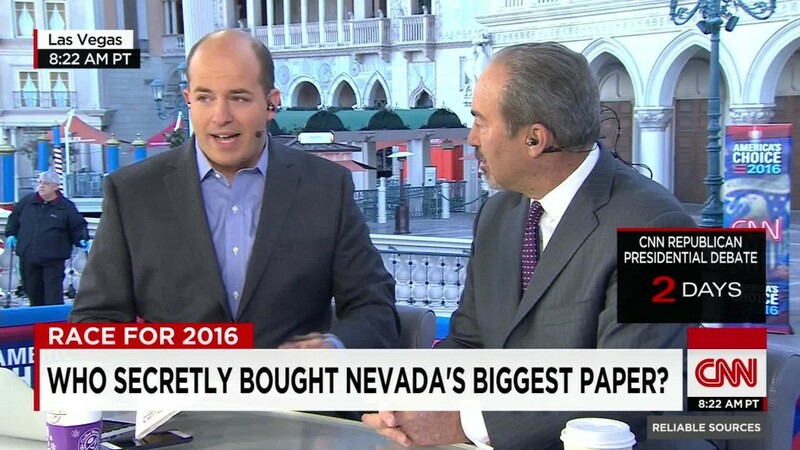 "As is the fact no one knows who owns Nevada's largest newspaper." The paper, which bills itself as "Las Vegas' most reliable source for news," was purchased for $140 million by a vaguely named company that appears to have been set up for the purpose of the sale, News + Media Capital Group LLC. The Review Journal published a follow-up story which reported that publisher Jason Taylor has told employees "that News + Media has multiple owner/investors, that some are from Las Vegas, and that in face-to-face meetings he has been assured that the group will not meddle in the newspaper's editorial content." Who might have wanted to buy the paper? "There's been speculation" about billionaire casino mogul Sheldon Adelson, "who owns a newspaper in Israel that he uses to wield political influence," Ralston told me. "I know there had been talks inside Sheldon Adelson's inner circle about purchasing a newspaper. But there's just no way to tell." The Huffington Post said an Adelson representative did not respond to its request for comment. "I just think that the pressure is going to be so enormous on this newspaper to reveal who its owners are that I eventually think they will have to come out," Ralston added.